What if you were able to trust God completely with your future? I know as a woman, letting go of control goes against every fiber in my flesh, but letting God lead is really the most freeing feeling in the world. Knowing that you have a Father that is absolutely enraptured with your presence, loves you with a love that can never run out and has no conditions and will fight for you through every storm is what we have through our Savior, Jesus Christ. 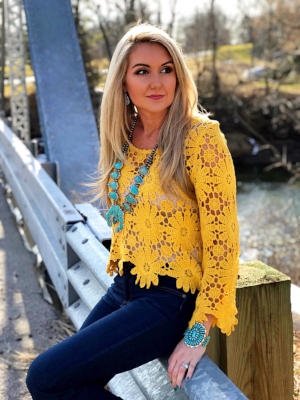 Brooke Carmean, owner of Soul Revival Boutique, decided to take God at His word and trust Him to lead in her life and what a ride it has been for her. Nothing compares to watching someone walk in the fullness of who God has called them to be and seeing the impact they have on the world because they are a follower of Jesus Christ! It's an honor to share Brooke's Brave Story with all my friends! I grew up in Athens, Georgia and my parents divorced when I was 5. My mom worked really hard as an office manager to provide for my brother and I. Once a year or so, we would get to go visit my dad where he was living at the time in Oklahoma. I loved riding horses, distressing furniture, painting, and fishing. I actually ended up going to nursing school because I thought that is what I was "supposed to do." During that time, I began dating a rodeo cowboy, which was an emotionally and mentally abusive relationship, but instead of listening to God - I listened to what I thought I needed. I moved to Oklahoma (partly pursuing a relationship with my dad - it has never been the best) and partly to pursue the cowboy. I quickly learned, that it was not a loving relationship and not where I needed to be. I broke it off with him and while sorting through and growing through with the mess, I began to go out to my dad's place and ride horses again. It was extremely therapeutic to just let my thoughts go and focus on healing. Rewind to how I met Aaron! During my relationship with the cowboy, I went on a cruise with two groups of friends from Kansas and Oklahoma. We met a ton of people from Ohio during the trip. After the vacation, everyone ended up friend requesting one another on Facebook. Fast forward a year and a half later, I was single. Aaron (my now husband who was with the Ohio group) ended up messaging me and we decided to meet in Nashville for a concert. It was literally love at first sight. "God doesn't call the qualified, he qualifies the called." That is just so true. We slept on dirt floors, with chickens and dogs, and under mosquito nets. My comfort was a small price to pay, versus what those people go through. God just needs you willing. He just needs you ready to do what He says. In the end, it wasn't me making an impact on the Nicaraguans, it was them making the impact on me. They freely worshipped, unashamed, GRATEFUL, and just so happy to be alive to serve God. It is an experience that I will never forget and I truly hope that I can go back again someday. Only eight months into our marriage, we decided together to go to Nicaragua on a medical missions trip. I was completely broken over the experience. Getting to feed an entire village for under $150 and knowing it would be their only meal of the day, was crushing. But God planted something in my heart and right then and there and I knew I would never be the same. I was working as a RN at a corporate job with an insurance company and I remember exactly where I was when I told him my idea. We were sitting in an airport waiting to catch a flight home from the beach, and I was really nervous to mention it to him (I had just wrapped up finishing my BSN Degree in Registered Nursing - I had gone from an LPN, to RN with an associates, and then on) and when I blurted out my idea - he was like, "Go for it, I think you would do awesome at it." We prayed and I called a family friend that week who owned a jewelry shop for years, and she gave me the best advice: Go to a market and find what type of boutique I wanted to be. Being from the south, and having family out west (and recently living in OKC) I always got complimented on my style and mixing things up. I knew that I wanted to dress the fun loving (stand out for good) women - whether they were sassy southern belles or gritty cowgirls! That's what I loved being around and standing for. Aaron came back to me about a week or so later, and asked - What is going to make you stand out? How will you be different from every other boutique? He is a Dentist and very business savvy. Whereas, my training was in a totally unrelated field. We had just been in Nicaragua earlier that year for mission work, and I knew God was nudging me to give back. To help people in need - to be a light and make a difference. I knew we wanted to be Bible based and to post about scripture. It's led into Facebook Live weekly devotions, to girls writing me messages asking for prayers and even some women just connecting in a way that the Bible was relating to them in a new light when we read scripture and did our devotions. I love fashion - but it was never all about the clothes. I wanted to share the Gospel too - whether women shopped with us or not, I knew they would see our posts on social media. On a regular basis, I can just cry at how God has moved in our boutique, and to the lives and missions that it is touching. He gets all the glory, because there is no way that we could be doing what we are, without him right at the head of it. When we began, we gave back first to Nicaragua. I learned while abroad, that you could feed a village of about 200 people for $100. I have a HUGE soft spot for feeding people. Something that we take for granted on a daily basis, is stripped away for third world countries in other parts of the world. We then began to broaden our mission. I always pray and seek God to lead me to what He wants us to do. To date, we have given back to Operation Christmas Child (this is one of my faves), missionaries to Haiti, Nicaragua, our local food bank, Butterfly Backpacks, World Vision International, Food for the Hungry, St. Judes, the A21 Campaign, Teen Challenge, One Orphan, and adopted families at Christmas. When we do shows with our airstream trailer, I would always meet someone that God divinely planned out and a lot of times we would give back to their organization. Butterfly Backpacks in particular was started in memory of Maegan Mills. She was a beautiful butterfly that floated into God's hands on February 9th, 2014. Their mission is to help those in need who she would help. Backpacks are given in honor of her memory to girls and women in homeless shelters. Each backpack contains basic care necessities and a handwritten letter to help inspire a new life and transition like that of a butterfly. I met Maegan's mom, Tina, with Aaron on our first date. She had sold us concert tickets two years prior. God just knew that he was going to use Soul Revival to help Tina see her dream for Maegan's life become a non-profit organization. I have chills even thinking about how He has orchestrated all of the people and places we have given back to. When I began Soul Revival, it was literally a hobby. I was packing orders at midnight on my kitchen counter and I had no idea that it was become what it is now. I had a comfortable dream corporate RN job that I enjoyed, but I knew God was leading me to trust him and step out of the boat. I was happy with nursing, but I loved getting to make women feel better about themselves. Aaron and I talked about the possibility of me leaving my job and we prayed about it. I kept having month after month of sales and I gave birth to our son, Cash in July 2016. I even went back to work as a new mom and more than ever I felt God tugging on my heart to pursue Soul Revival full time. We knew that it was time. I completely surrendered and turned in my final notice in April 2017 and I have not looked back since. It was scary and exciting all at the same time, because I knew God was reassuring me to take His hand and to just trust. A few months later, we ended up winning best boutique in Ohio and favorite online boutique in Ohio. We were featured in Cowgirl Magazine online and Western Lifestyle Retailer Magazine. God has taken care of every need that we have had as a family, and never in my wildest dreams would I think I would be a boutique owner and giving back like we have. It's been neat to be featured in some amazing publications, we have a combined total social media following of 55,000 followers, but the real icing on the cake is being able to share Christ to the rest of the world. We are getting the word out to people, that may not have ever had a relationship with Christ, or even been to a church, or read a bible. It's getting to minister to people allover the world from Australia to Ireland. Whenever I have gotten fearful, I have always come back to Matthew 17:20. Jesus said to them, “Because you have so little faith. For sure, I tell you, if you have faith as a mustard seed, you will say to this mountain, ‘Move from here to over there,’ and it would move over." You will be able to do ANYTHING. Our God MOVES MOUNTAINS. What is there to be afraid of? Fear will hinder you, and faith will drive you. God is always with you. You just need to step out of that boat. There is not a day that I look back on regret due to stepping out in faith. He wants the best for us and His plan is perfect. I lean heavily on Jeremiah 29:11 (I would even say it's my life verse) and recite it regularly. "For I know the plans I have for you," declares the Lord, "plans to prosper you and not to harm you, plans to give you HOPE & a FUTURE." We serve a kind and loving Lord that has a hope for us & an amazing future in mind for you. Rest in that, pray, seek Him, and don't let fear hinder you from taking that chance.